With two small boys to raise, a mountain of articles to edit for the Review of Applied Ethics, and the ever-increasing demands of her niece, Cat, who always seems to need a helping hand at the deli, Isabel barely has any time for herself. Her husband, Jamie, suggests acquiring extra help, and she reluctantly agrees. In no time at all, Isabel and Jamie have a new au pair, and Isabel has an intelligent assistant editor to share her workload. Both women, though, have romantic entanglements that threaten to interfere with their work, and Isabel must decide how best to navigate this tricky domestic situation. Can an employer ever inject herself into her employees' affairs? Meanwhile, Isabel makes the acquaintance of Patricia, the mother of Charlie's friend Basil. 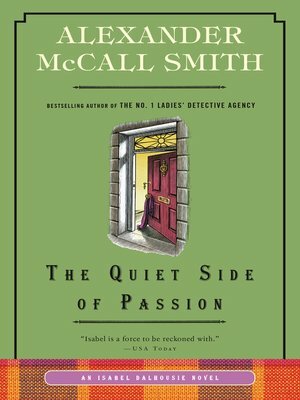 Though Isabel finds Patricia rather pushy, she tries to be civil and supportive, especially given that Patricia is raising her son on her own, without the help of his father, a well-known Edinburgh organist, also named Basil. But when Isabel sees Patricia in the company of an unscrupulous man, she begins to rethink her assumptions. Isabel must once again call on her kindness and keen intelligence to determine the right course of action, at home, at work, and in the schoolyard.